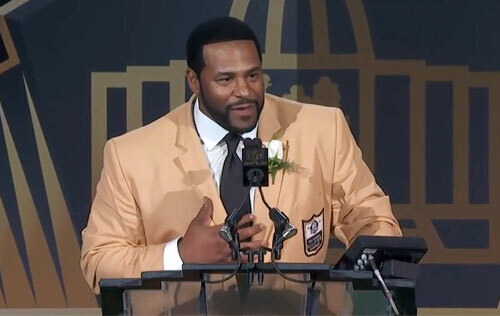 DEARBORN, MI – Former Pittsburgh Steeler half back and Super Bowl champ Jerome Bettis was the keynote speaker at the 35th annual Ford-employees African Ancestry Network (FAAN) event on Friday, Feb 26, 2016 in Dearborn, Michigan. The event was held at the Henry Autograph Collection Hotel in Dearborn. Source: RollingOut.com. Jerome Bettis, nicknamed “The Bus,” is a former NFL halfback who played for the St. Louis Rams and Pittsburgh Steelers. Bettis is sixth on the list of NFL rushing yards leaders. He retired in 2006 after the Steelers won Super Bowl XL in his native Detroit, Michigan. Bettis is a commentator for the NFL Network and a former NBC studio analyst for Football Night in America.